In theory, The Town that Dreaded Sundown should be one of the most bone-chilling films of all-time. A recounting of the 1946 Moonlight Murders in Texarkana, Texas, Charles B. Pierce’s pseudo-documentary presents a sleepy town haunted by a sadistic killer prowling its streets. By day, post-War revelry teems through Texarkana in the form of weddings, town square gatherings, and movie theater lines; by night, the inhabitants cower behind locked doors and boarded-up windows as a man wearing a burlap sack roams the area in search of victims. It’s a nightmare of Americana that could only have truly been bred in 1976, after the country had endured real, tumultuous horrors; something about such a banal evil descending on a quaint town certainly would have resonated with contemporary audiences (and indeed it still does—the notion is still quite terrifying). If only Pierce’s film were fully committed to that notion. Instead, it’s often a decidedly hokey take on the material, which is sort of jarring. One minute, you’re watching the Phantom Killer assault a couple of kids, while the next plays one of the cop’s stake-out operations for laughs because the dopey deputy (who is of course nicknamed Spark Plug) didn’t realize he would have to cross-dress for the occasion. The resulting tonal clash prevents the film being as chilling and unsettling as it perhaps could be, and the schizoid approach diffuses all the way down: for every Spark Plug, there’s a relentless, stern-faced Texas Ranger (Ben Johnson). For every horrifying appearance of the Phantom Killer, there’s a bumbling, broad episode like the one that sees Spark Plug careen right into a pond while in not-so-hot pursuit of a possible suspect. Imagine flipping between episodes of Cold Case Files and The Dukes of Hazzard, and you get the idea. Those Phantom Killer appearances are truly incredible, though. With the slasher genre still in its embryonic stages, Pierce still manages to construct sequences that would be populating screens in droves during the next decade. His film is perhaps a bit more manic and shaggier than its successors, as the scenes capture the sort of raw reality that Pierce was obviously shooting for with the pseudo-documentary style. Nearly all of them feature a chase sequence of some sort, as the Phantom Killer wasn’t a polished slasher like his fictional brethren; instead, his attacks were messy, elongated ordeals that lent themselves to some suspenseful sequences here. Whatever the Phantom Killer lacked in cold-blooded polish, he made up for with a positively eerie presence. His appearance might have been co-opted by Jason Voorhees five years later in Friday the 13th Part II, but The Phantom wore it better here. While he likely earned his moniker due to his elusiveness, he may as well have done so due to his spectral look—that burlap sack really gleams in the moonlight and allows him to creepily flit around in the frame. There are numerous shots that prove to be memorable, with almost all of them featuring the Phantom sneaking and skulking about. Arguably the most terrifying moment has the killer peek into a quiet home before opening fire on the couple inside. The film is laced with similar events that make you wish Pierce hadn’t brought so much hokey levity to the film. It’s jarring to think that this film can feature such Podunk humor when it also has a scene where a sadistic spree killer torments a girl by fiddling with her trombone before killing her. Pierce also deftly turns the killer into a ghastly figure with a boogeyman presence that haunts the entire film. When he is on-screen, he’s an animalistic menace, all beady-eyes and heavy breathing; however, when he’s not around, he’s still out there somewhere, likely walking the streets of Texarkana as one of its everyday citizens. Vern Stierman’s narration sometimes obviously accentuates the on-screen events, but other passages play up that boogeyman quality—sometimes, it feels less like he’s describing a cold case and more like he’s relaying a campfire story. Even the film’s police procedural feels completely doomed since the outcome isn’t in question; to his credit, Pierce is still able to render this uncinematic story (there’s technically no ending) into a decent procedural that climaxes with a very Hollywood chase scene before drifting off into a killer coda that speculates that the killer could still be wandering the streets, a notion that would have admittedly been more plausible in 1976 but not so much now. Still, that’s exactly the type of stuff the film should be up to for its entire running time, so it leaves on a high note. When it wants to be, The Town That Dreaded Sundown is exactly the type of film it seems like it should be: weird, unsettling, and even visceral. The faux documentary style and Pierce’s regional flavor also make for a wholly unique experience that adds to both the charm and realism. Part of the film’s effectiveness hinges on its glinty-eyed nostalgia for a Golden Age and then tossing it into a mean-spirited, 70s blender during the slasher scenes. For whatever reason, the film seems oddly anachronistic and anonymous—this might detail actual events that continue to haunt the town of Texarkana, but it feels like it could have been Anytown, U.S.A. It all adds up to a film that mostly works, with its overall sense of dread eventually triumphing over its creakiness and its tonal warts. Perhaps it doesn’t live up to its promise by landing among the most bone-chilling experiences of all-time, but it would basically qualify as one of the most memorable episodes of Unsolved Mysteries ever. 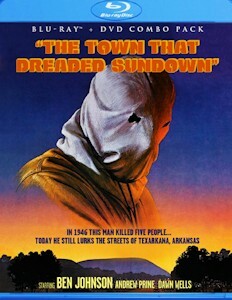 As such, I might like the idea of The Town that Dreaded Sundown more than the final product—there’s a truly incredible idea here, and kudos are in order to Pierce for attempting to tackle it in unique fashion. With the film set to be remade, I can only hope producer Jason Blum and company follow in their predecessor’s footsteps by approaching it from the simultaneously true and mythical status of the Phantom Killer. After all, the scariest boogeymen are the real ones. Luckily, we won’t have to wait for the remake’s debut in order for the original film to get a respectable home video treatment, as Scream Factory has finally brought this one to the digital age. And I do mean finally: The Town that Dreaded Sundown has been on collectors’ wishlists for over a decade, and they can finally set aside those old, beat-up VHS copies in favor of Scream’s Blu-ray/DVD combo pack. It’s a lavish release that’s been worth the wait, too. Among the chief attractions here is the restored video presentation, which finally presents the film in its original scope ratio for the first time since it played on drive-in screens. With the exception of some occasional print damage, the transfer is immaculate considering the low-budget source material. The colors pop and the details are sharp without the assistance of artificial noise reduction. A lossless DTS-MA stereo track accompanies the visuals and is similarly solid; obviously, one shouldn’t expect a full workout for their home theater system here, but it gets the job done. The disc’s plentiful supplements provide a nice mixture by focusing on both the film’s production and the true story that inspired it. A feature-length commentary with historian Jim Presley is the centerpiece, as he discusses his own work on the case, which adds an extra layer to the film’s more informational mode. A trio of interviews with Andrew Prine (who plays a Texarkana deputy in the film), Dawn Wells (one of the killer’s victim), and cinematographer James Roberson illuminate some of the film’s production. Prine’s recollections are especially anecdotal, while Wells mostly focuses on her memorable scene in the film. Roberson’s interview provides some nuts and bolts stuff, as he discusses shooting on a low budget and the staging of several scenes. The typical promotional material is also present in the form of a trailer and a gallery of posters and stills. If there’s a criticism to be made, it’s that Scream hasn’t graced this disc with a comprehensive mini-documentary that’s been found on many of their releases; instead, there’s a text essay by Brian Albright that provides a thorough look at both the case and The Town that Dreaded Sundown. Among the most interesting stuff is the contemporary reaction towards the film, as Albright notes that, while most of the film’s grosses came from screenings in Texarkana, a lot of the citizens were unsettled by the film’s insistence that the Phantom Killer still lurked about. Scream Factory makes it difficult to be too critical about any perceived omissions, though, especially since the DVD copy of the film also features The Evictors, Pierce’s more traditional return to the horror genre from 1979. Essentially, the package gives you two films for the price of one, and they’ve even had the decency to stick with the original poster art that only became more iconic as the Phantom Killer’s visage haunted video store shelves for two decades. There’s really only one more request I could make at this point: with Scream showing Pierce so much love, here’s hoping they can wrangle the rights to The Legend of Boggy Creek, which has been long due for a proper restoration. In the meantime, reserve a spot for this one in your next dawn to dusk marathon. Wait for sundown, of course.